African Carbon Energy have identified an opportunity for a conceptual study related to the generation of 600 MW electricity using Integrated Gasification Combined Cycle (IGCC) technology. We believe that UCG is the future of clean base-load coal power generation and will support our country’s’ drive for local mining development, BEE transformation and resource beneficiation. South Africa’s power system is currently constrained and vulnerable given our old and deteriorating power plants and delays in the completion of major new power stations, with end-of life, statutory emission abatement retrofits and abnormal events (from inclement weather to equipment failure) having the potential to cause power deficits. Africary will be ready to bridge the gap left by ailing end of life Eskom power stations to be decommissioned from 2019. Eskom Plant 50 Year Life and Air Quality Retrofit Schedule. In the next 4 years SA will close down several 3,600 MW power stations. Some will be retrofitted just to be shut down 1 year later. 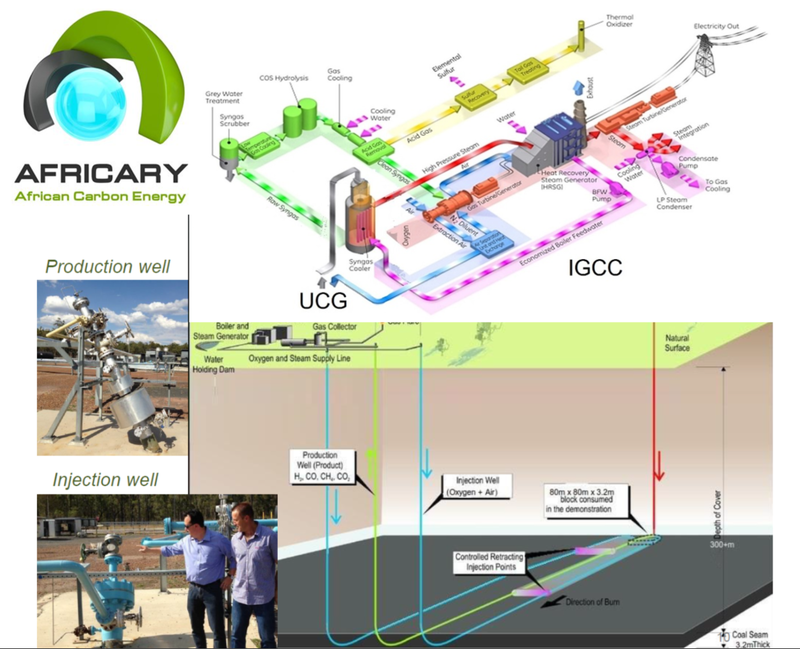 Africary is in the process of converting its prospecting right to a mining right as it has already completed all permits and requirements for its flagship 50 MW UCG Project (“TUCG”) and plans to become a strategic partner to roll out an additional 600 MW capacity and has the retained capacity to build up to 2 000 MW by 2025 in immediate support of the province and the countries needs. Integrating Africary’s clean and environmentally friendly coal mining technology with super efficient IGCC system. Country Benefits and Opportunities for a 600 MW Africary UCG IGCC project.